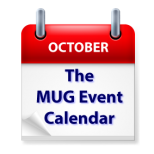 Presentations on iOS 9 in California and Arizona and El Capitan in Ohio and Maryland are among the top presentation subjects on this week’s MUG Event Calendar. Jason Snell of Six Colors will visit a California group, and GoPro cameras will be shown off at a Pennsylvania group. iPhones, a First Class BBS, Photoshop alternatives, 3D printing and a photos contest are among other topics coming up.